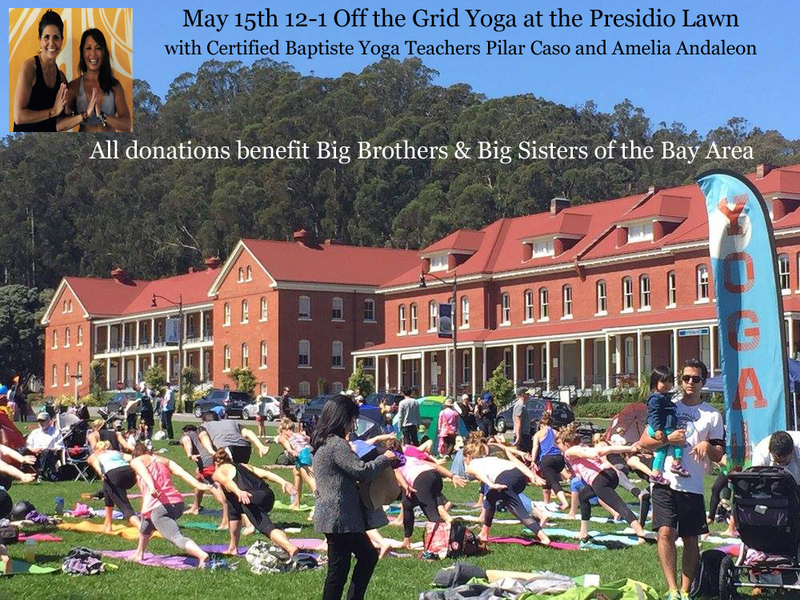 Take a fun, outdoor yoga class from me and my dear friend and fellow Certified Baptiste Yoga Teacher, Pilar Caso at the Off the Grid Presidio in San Francisco Sunday May 15th 12-1pm. This is a free class offered by Baptiste Yoga San Francisco with donations benefitting Big Brothers and Big Sisters of Bay Area. This entry was posted in baptiste yoga san francisco, special yoga event, yoga in the san francisco bay area, yoga outside and tagged baptiste yoga, bbbsba, big brothers big sisters of bay area, free yoga class, off the grid presidio picnic, off the grid san francisco, off the grid sf, outdoor yoga, presidio lawn, presidio picnic, san francisco, yoga. Bookmark the permalink.